PINK I.C.E. Medical ID band with buckle. 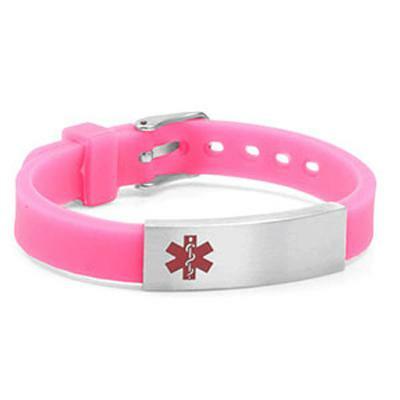 Adjustable silicone-rubber bracelet comes with a stainless steel medical ID tag. Because the bracelet is adjustable, it is perfect for active children and adults, such as joggers and cyclists! Latex-free. The tag has a brushed (matte) finish. [It can be engraved with medical or I.C. E. (in Case of Emergency) contact information. Water Resistant Only - Band color will fade with exposure to chlorine. *This laser engraved item not available for further discounts. Sizing: Please do not order if your wrist is not between 5.5" to 7"
Adjustable from 5-1/2 to 7 inch wrist.